"Is This Your First Funeral?" -- meant for children -- is a gentle introduction to the events surrounding the death of a loved one. Is This Your First Funeral? No one likes to talk about it, but it’s highly likely that some time in childhood, your child will have to go to his or her first funeral. How do you prepare them? This simple book for children is a kind introduction to what goes on around the death of a loved one. 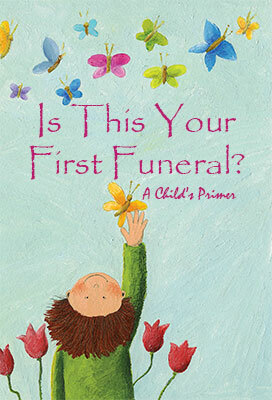 The likely sequence of events, the feelings, and what to expect are spelled out in a simple form.This book gives children an introduction to funerals in a sensitive, no-nonsense manner. It offers insight into the emotions they and others may be feeling and normalizes the experience. It's a gentle guide through these uncertain moments. What to expect. How to find a way through the process of grief. How to accept the moments and share feelings. There are nice illustrations, as well. Jimmy Huston is a recovering screenwriter and filmmaker who lives with his wife and dog in Southern California, and remembers his own children struggling to deal with family deaths and funerals.